This year I have been working on the last three prints of the Flights of Fancy series. It is all a bit arbitrary but I have decided to end the series with a print inspired by Emily Dickinson’s poem Hope is a thing with feathers. This is still in then planning stage but will feature a storm…… probably at sea, and a bird! 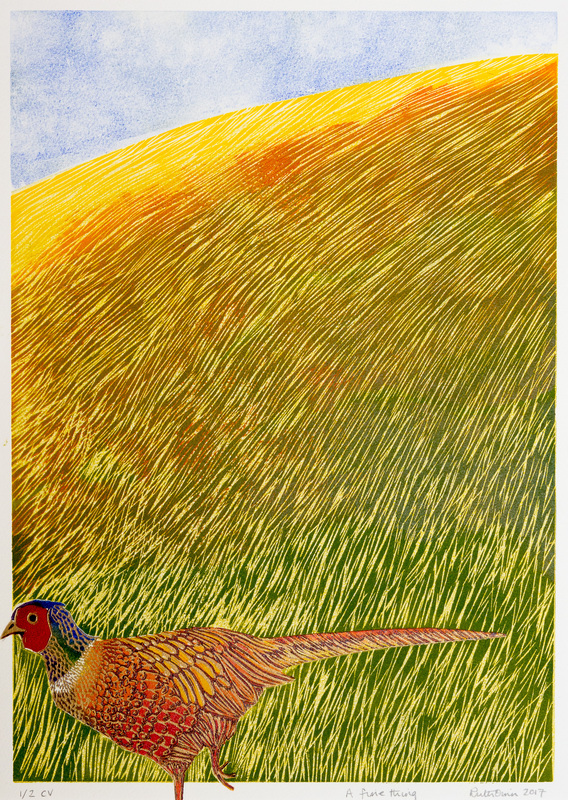 I have just completed my pheasant (see above) inspired by Sylvia Plath’s poem Pheasant. This is going off next week to the the Cambridge Gallery for their Summer show, along with a selection of other work from Flights of Fancy. The third piece features a water rail and relates to a haiku about this secretive and rarely seen water bird. In this print I have developed further the use of chine colle and collage which I am aware has become a bit of a feature in my work. It’s not yet finished but I am cutting reeds at a rate of knots. I have booked myself in to a two day workshop on Collage with Mark Hearld in July, so I suspect there may be more to come! This entry was posted in Uncategorized by ruthoinn. Bookmark the permalink.